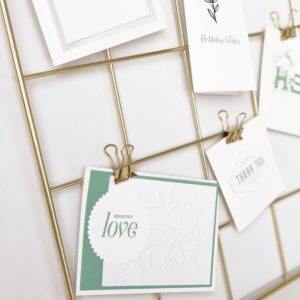 Cards / Crafty / Stampin’ Up! 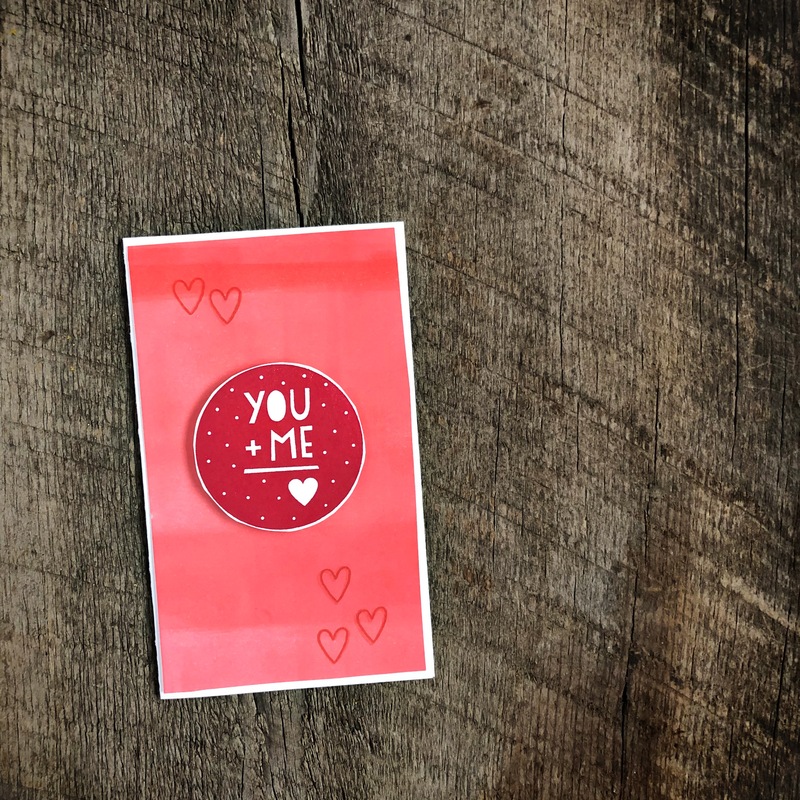 Are you ready for Valentine’s Day? Well, my daughter’s class Valentine’s aren’t quite ready yet, but at least I have the cards for all the grown-ups ready! 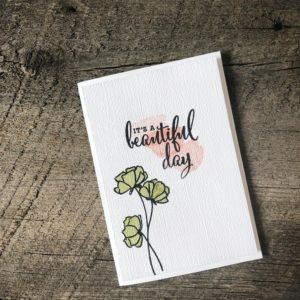 Some of my favorite Stampin’ Up! 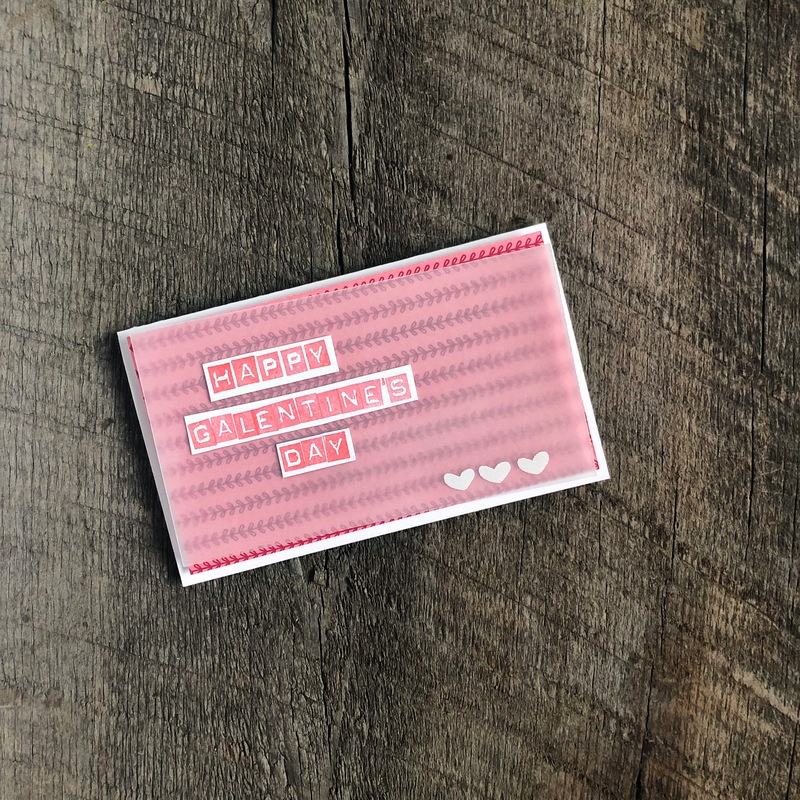 stamp sets in my craft closet are Valentine’s Day themed. 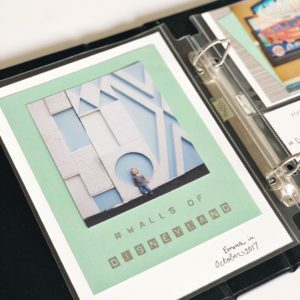 Now that I have my craft stash de-cluttered KonMari style, it is much easier for me to find the things I love and pull them out to re-use them. 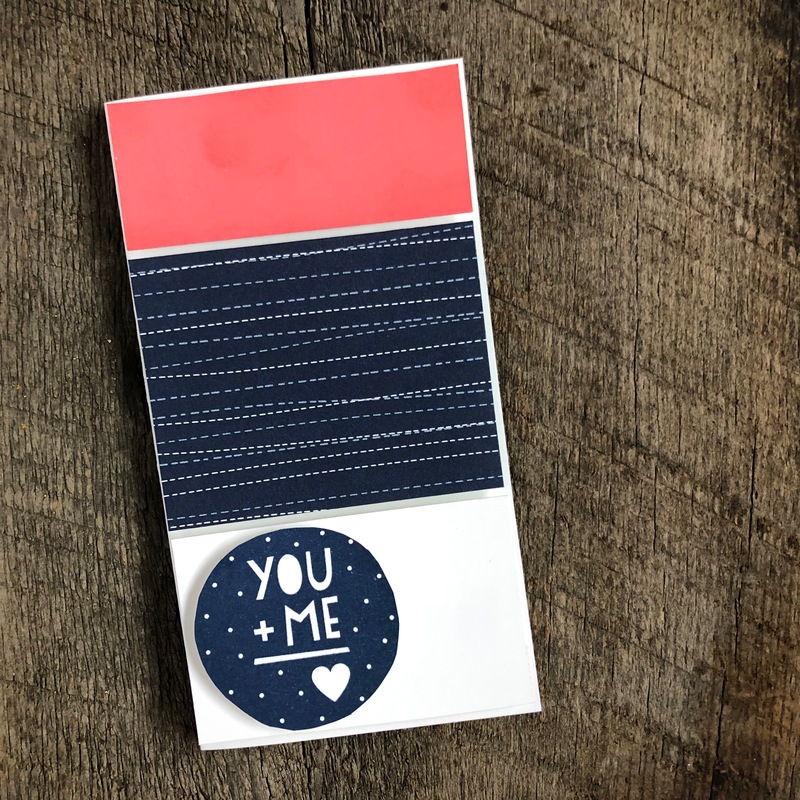 So, for Valentine’s Day this year I grabbed one of my favorite older stamps (“You + Me”) and combined it with some stamps and ink colors from this years catalog. I used Flirty Flamingo and Lovely Lipstick ink pads along with classic colors like Real Red, Night of Navy and Calypso Coral. 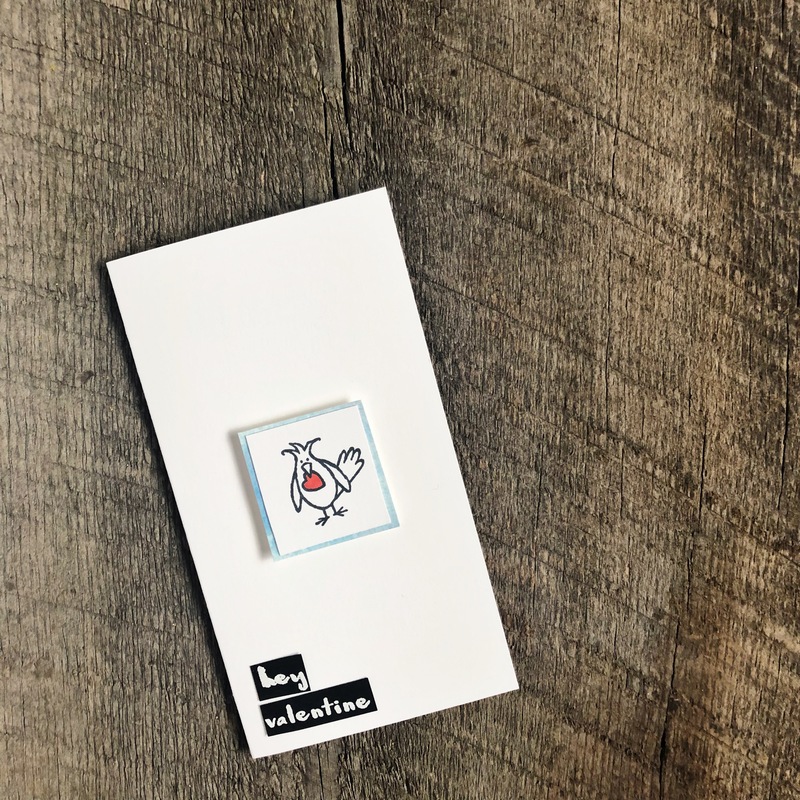 I love this little bird stamp from the current Occasions catalog, and the “watercolor” stamp from the current Annual Catalog is going to be one of my favorite stamps for years and years to come. These border stamps at the bottom of the card are from the Bloom by Bloom stamp set; I stamped them in Calypso Coral, Real Red, Flirty Flamingo and Black. 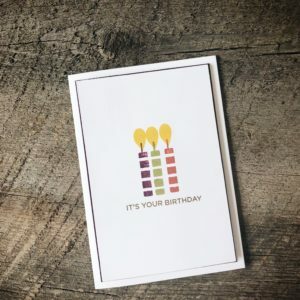 What do I do if I don’t have any card stock in a particular color? 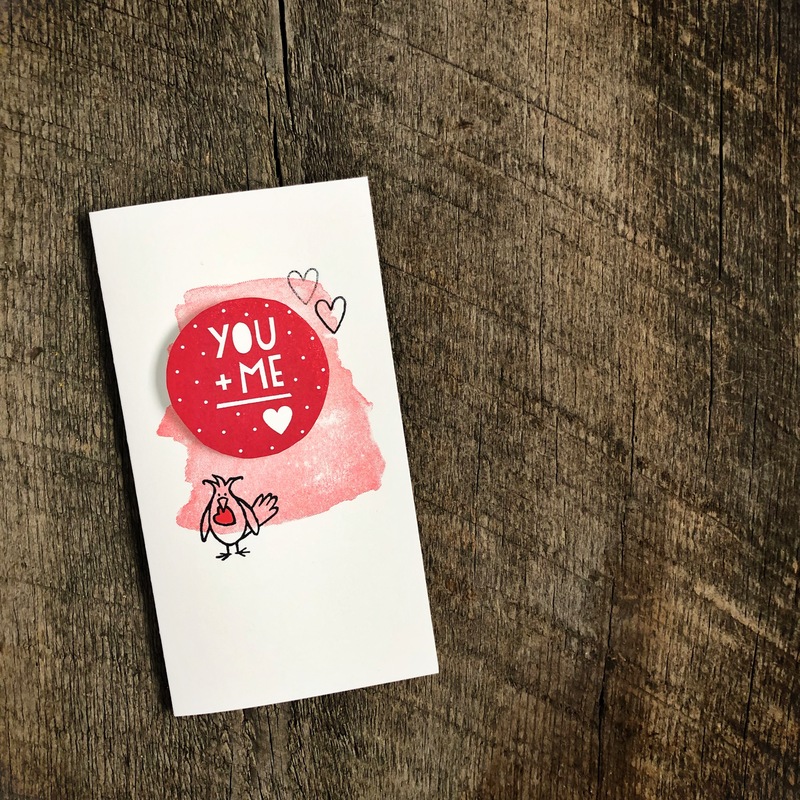 In this case, I didn’t have Flirty Flamingo card stock on hand, so I used a rubber brayer to ink up a piece of white paper with ink from the inkpad and created my own. I love the uneven texture that was the result; almost like a watercolor effect. Here I used some Twinkle Twinkle designer series paper along with the Night of Navy ink for the stamp. I used some brayered Flirty Flamingo paper as well. Do you have any favorite items in your craft stash that you return to time and time again? Hopefully this inspires you to dust off some of your favorite things and put them to use again! Like many people, I have spend the last few weeks coping with post-Christmas January blues by “KonMari’ing” my home. I’ve actually been a Marie Kondo fan for a few years, but since her TV show was released I have been intensely focused on tidying the home we have lived in for the last year and a half. First step: clothes. Done. What the consignment store didn’t take is waiting to be shipped off to thredup. I had done a major clothes purge a few years ago, but I was able to reduce even more over the last few weeks. Next: papers. Done already, mostly. Last year I was so overwhelmed with boxes of papers that I decided to absolutely discard everything except the bare essentials of birth certificates, deeds, etc. The mental shift to discard everything was the only way I could effectively deal with boxes and boxes of papers. So then, on to my next step: tidy my CRAFT SUPPLIES!!! WHOO HOO! On to the fun stuff. I reduced my craft supplies to only what I truly love,. Once I then had fewer items, I was able to reorganize the remaining items in a closet where I have easy access to each product. No more making messes just to go through box after box looking for what I want. It was easy for me to forget about my favorite craft supplies when they were buried in with so many other items, but now that things are tidy, I can focus on what things I love. Watercolor. Watercoloring is one of my absolute favorite techniques and I really want to spend more time doing it. 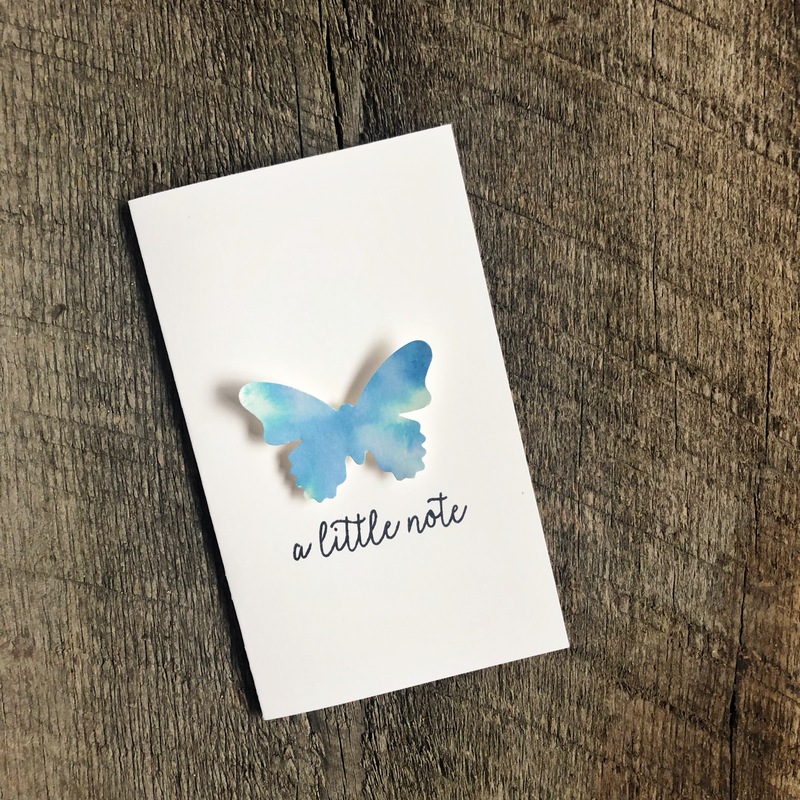 I pulled out some shimmery white card stock and watercolored blue ink all over, then punched out the blue butterfly. I also used watercolor to create the small blue square that is the background layer for the small bird stamp. 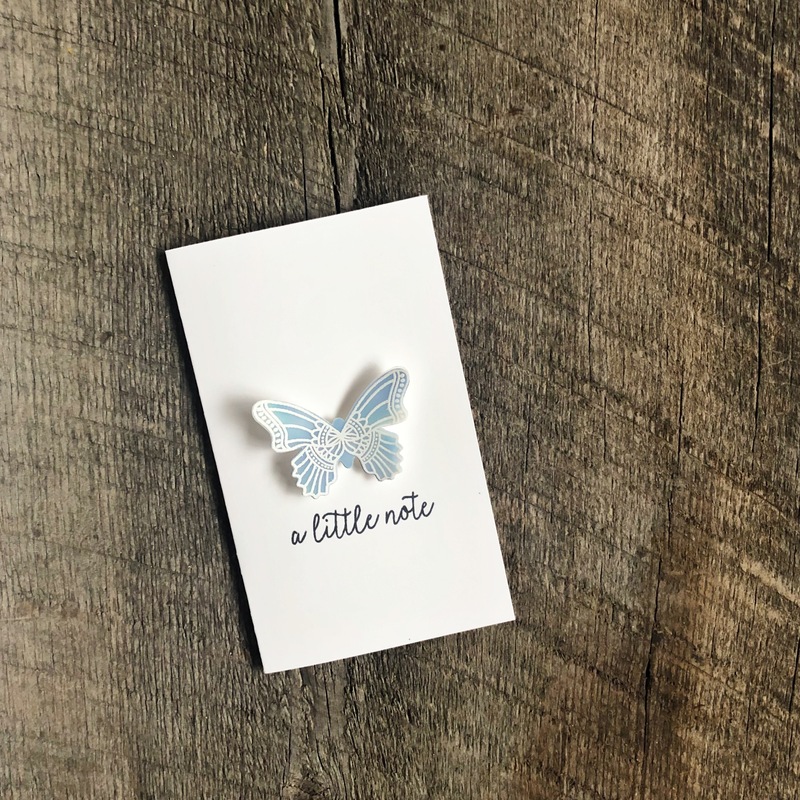 It’s very subtle, but instead of using blue card stock (I don’t have any of this balmy blue card stock on hand) I water colored the blue ink on white card stock to DIY my own, then cut out the square. Vellum. 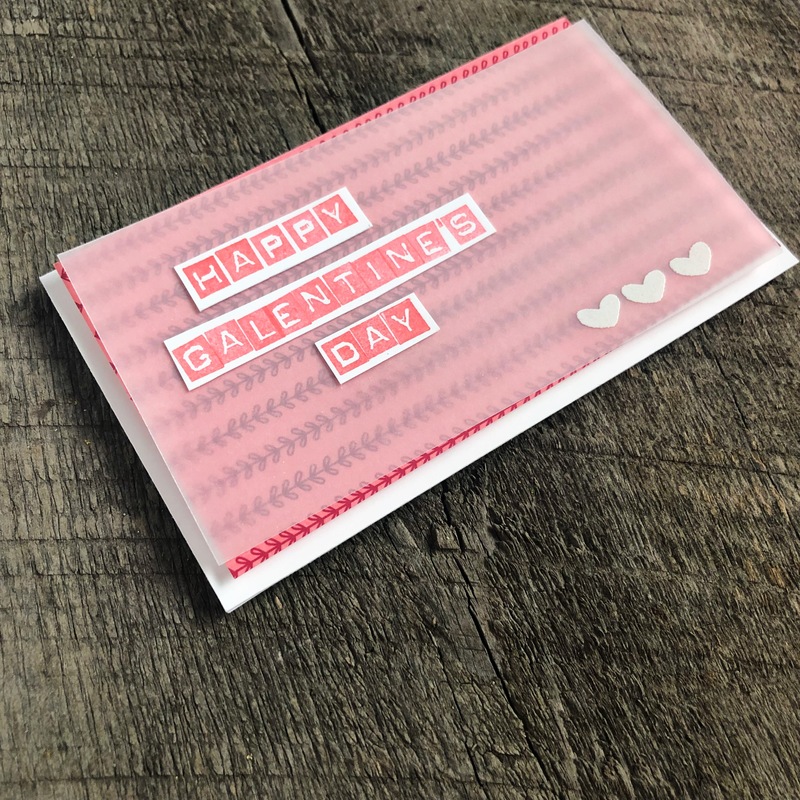 On this card, I layered a sheet of vellum over the patterned card stock and heat embossed the hearts (from an older stamp set) with white embossing powder. 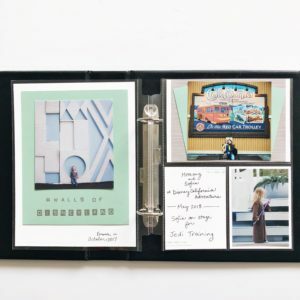 I love vellum SO much! Alphabet stamps. I love this stamp set SO much! I use it for so many things. It’s one of those sets that I know I will keep for years and years. Tiny accent stamps. 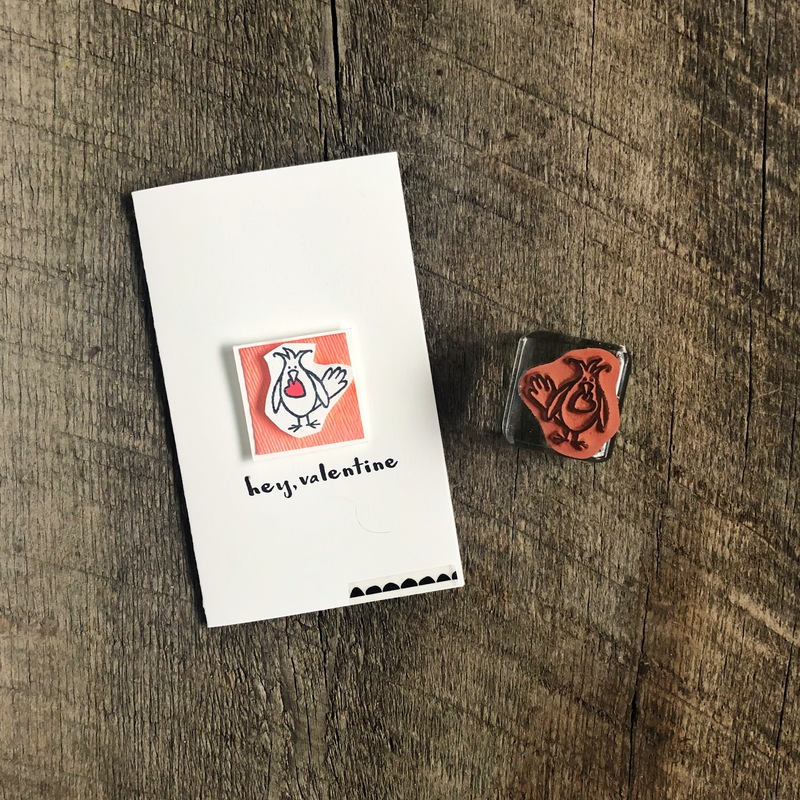 I often use little stamps like these hearts to add a bit of accent. 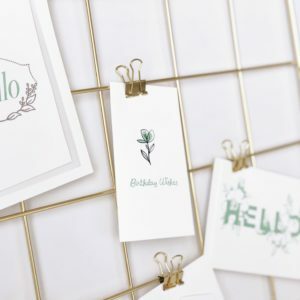 Small stamps, to allow for lots of white space on a card. 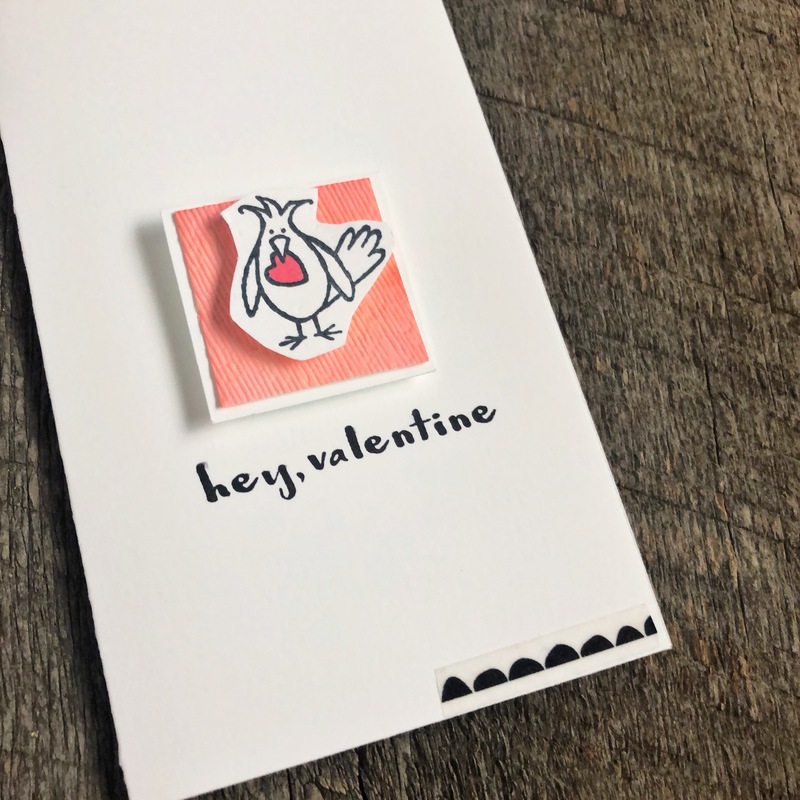 I love this little bird stamp from the new Valentine’s Day set. 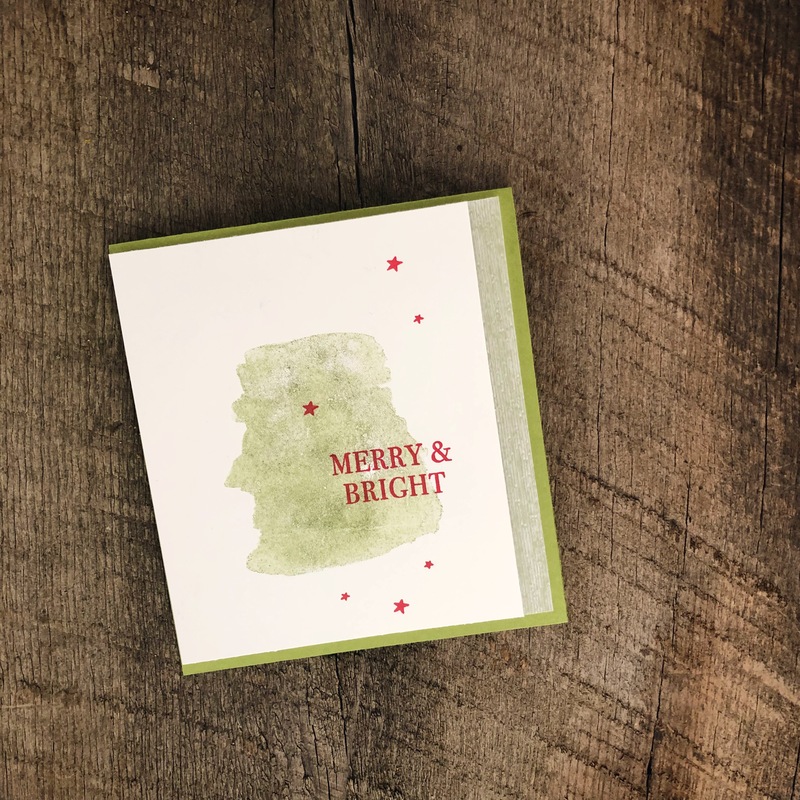 It’s so cute, and allows for a small stamp to be placed on a card with room for a sentiment but still lots of white space on the card. Blend markers. 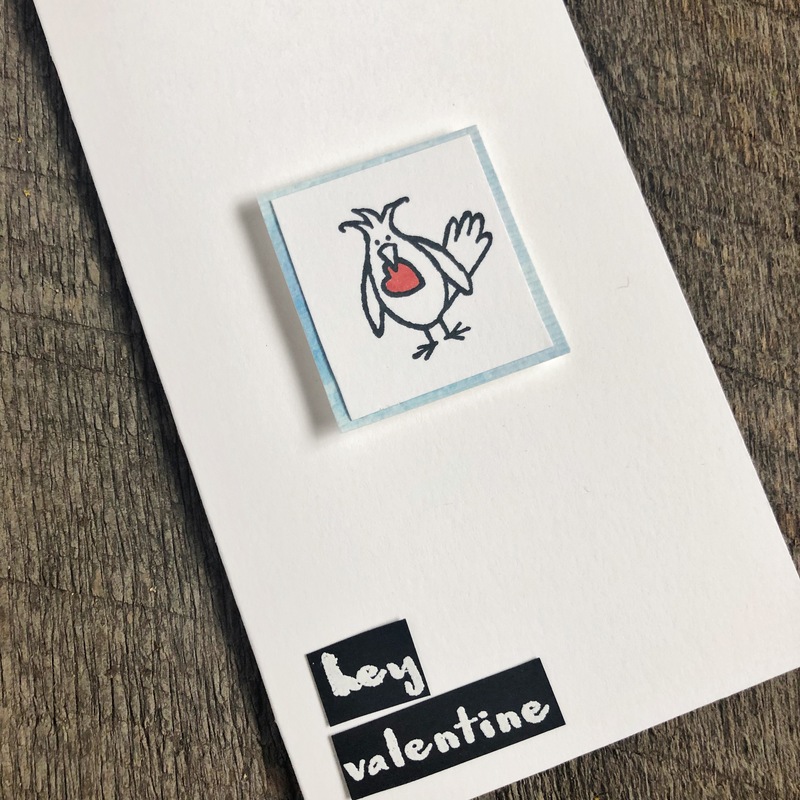 I didn’t use my markers very much on these cards – just a tiny hint of marker to color the heart that the bird is carrying. But these markers are one of absolute favorite products ever! 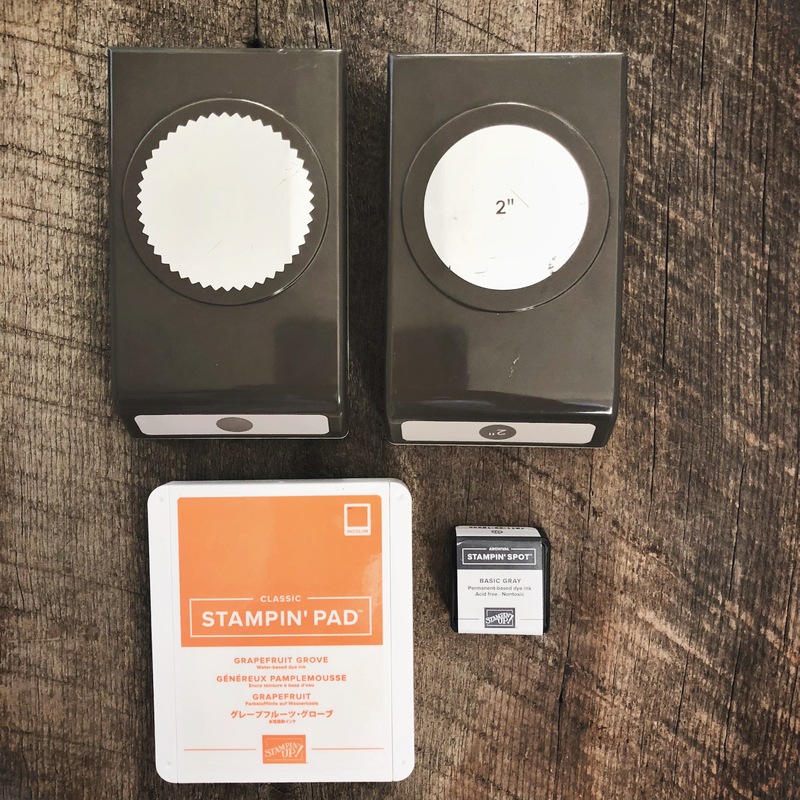 When I started Stampin’ Up! about 4 years ago, I shook my head at the idea of coloring in stamps with markers; I thought it would be way too time consuming. But my mind soon changed and I learned how much fun it is to color. And these Blender pens are the best; I love how smoothly the color flows on to the paper. Washi tape. 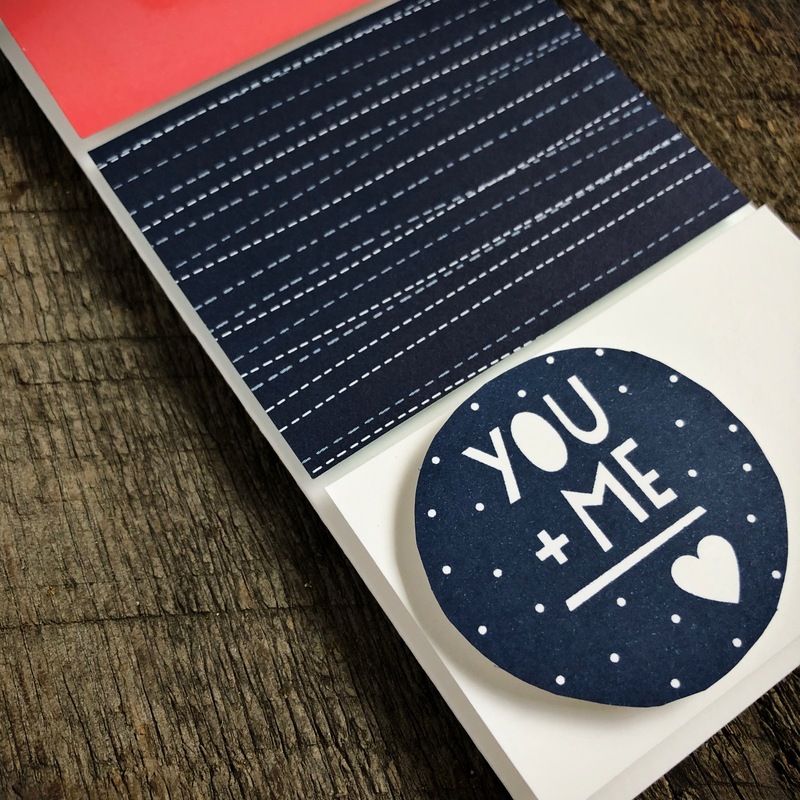 A hint of accent with some washi tape is a great added embellishment. 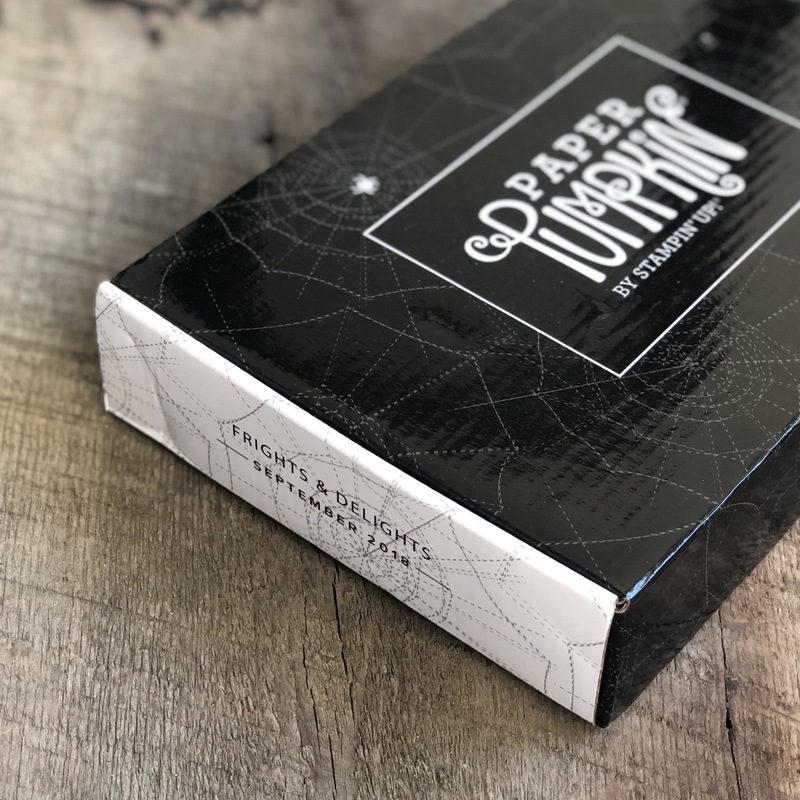 The tiny strip of washi tape on this card is from a fabulous set of black and white washi tapes in this year’s catalog. Textured paper. 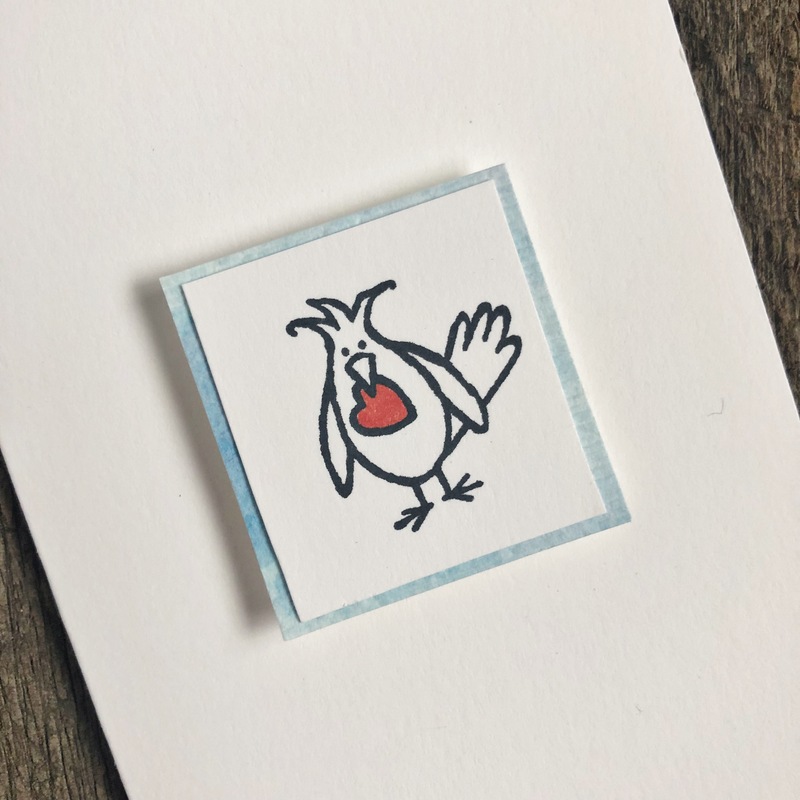 This little square colored background behind the bird is watercolor paper that I watercolored with Poppy Parade ink, cut out into a square and added even more texture with the textured embossing folder. I adore the texturing embossing folder that is in this year’s catalog; it adds a bit of contrast to smooth card stock. Heat embossing. This is one of my favorite techniques. 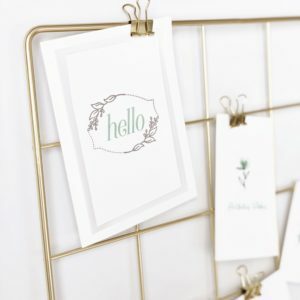 It’s so much fun to turn the heat embossing tool on and heat up the powder embossing and watch it melt into the final product. 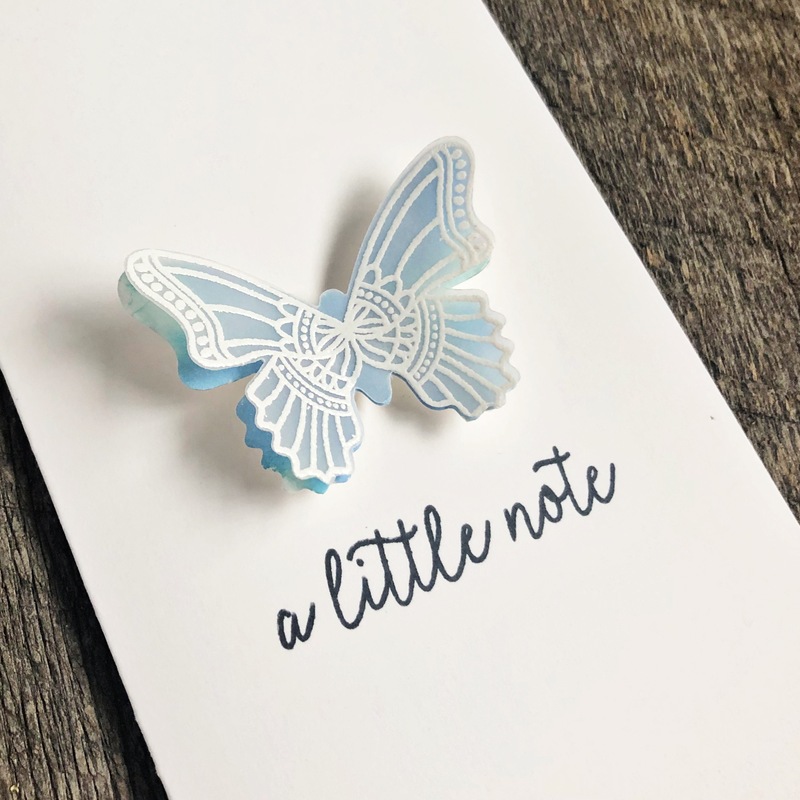 Here I combined vellum with the heat embossing and placed it over a blue butterfly background to give it a hint of color peeking through. Ultimately, my approach to cards and crafting is the same as my approach to tidying: keep things simple. Surrounding yourself with only the things you love is the best way to chase the blues away all year ’round, not just in January! 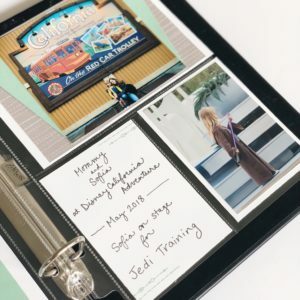 Now, check out the rest of our blog hop team! 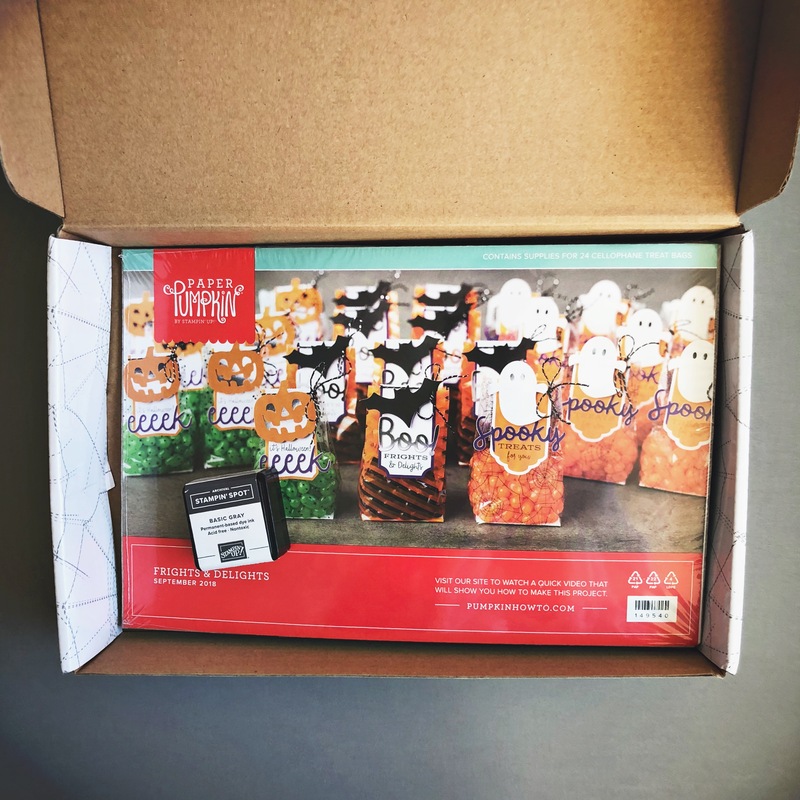 For this month’s blog hop I thought I would take some stamp sets that aren’t holiday themed and combine them with some Christmas sets. 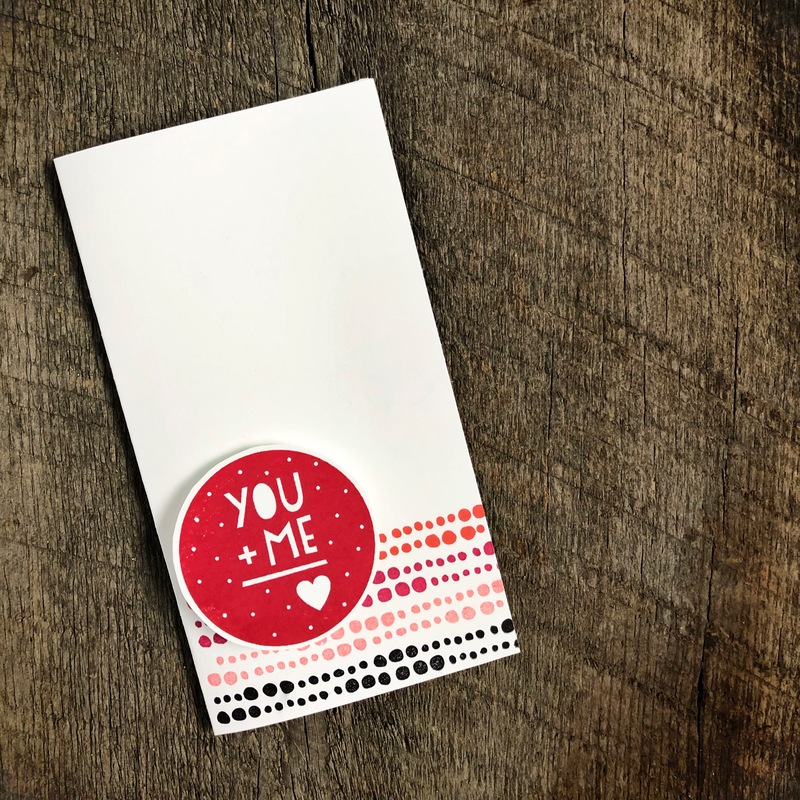 One stamp set that I will be using for years to come is the Love What You Do set with this amazing “watercolor” background stamp. I used it here along with the sentiment stamp and stars from the Hearts Come Home holiday stamp set. Of course, I had to try it in different colors. Here it is in Garden Green and Real Red inks. 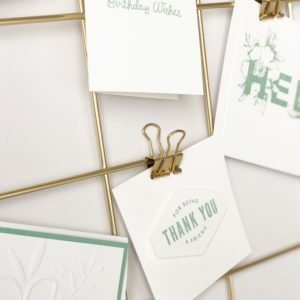 I used the Subtle Dynamic Textured Impressions embossing folder on many of these cards, including this one, to give a big of extra texture to the paper. 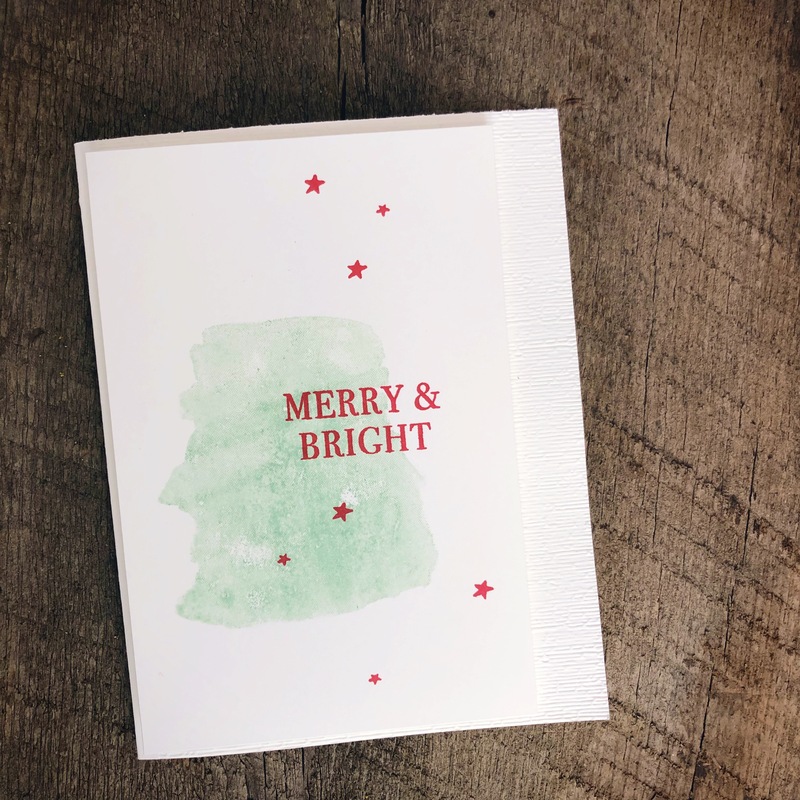 I didn’t use any holiday stamps here – I used the Labeler Alphabet stamp set to stamp “NOEL” and used my brayer to sponge on some Mint Macaron ink. I used the Petals and More thinlits to cut out the flower embellishment on my Big Shot die-cutter. 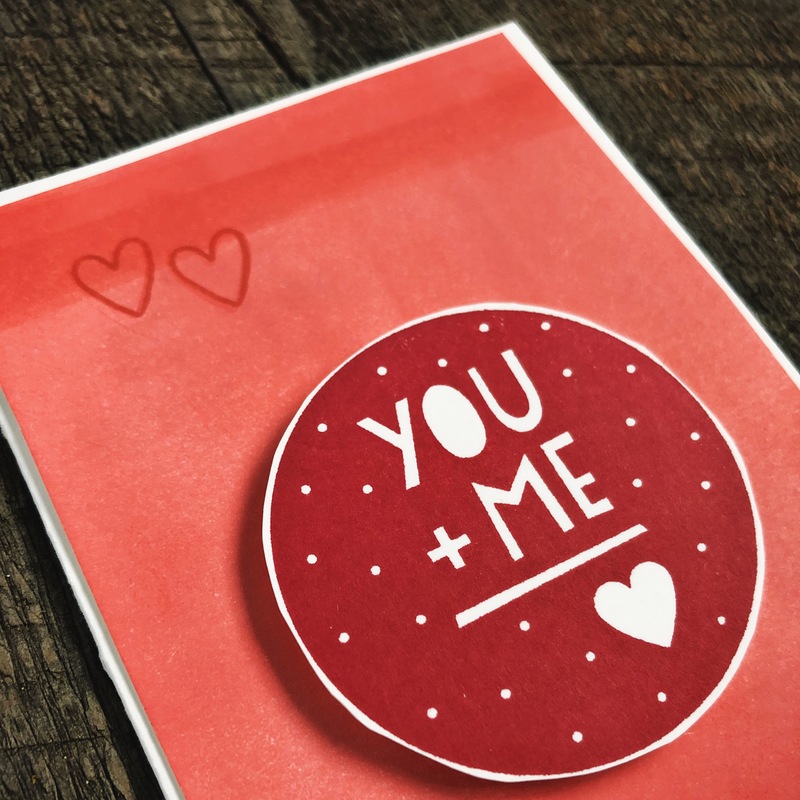 For this card, I used the sentiment stamp from Hearts Come Home, and then just circle punched out an opening on the top layer with my 2 inch circle punch. I put a bit of Designer Series Paper (from the Twinkle Twinkle set of papers) underneath the top layer and hand drew the ornament hanger above the ornament. 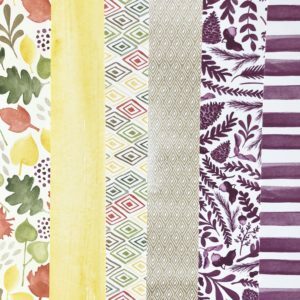 This is a fun way to use up some scraps of your favorite patterned papers. You could of course just punch out the circle and place it on top but I liked a different layered look. This is my take on a simple and modern card. 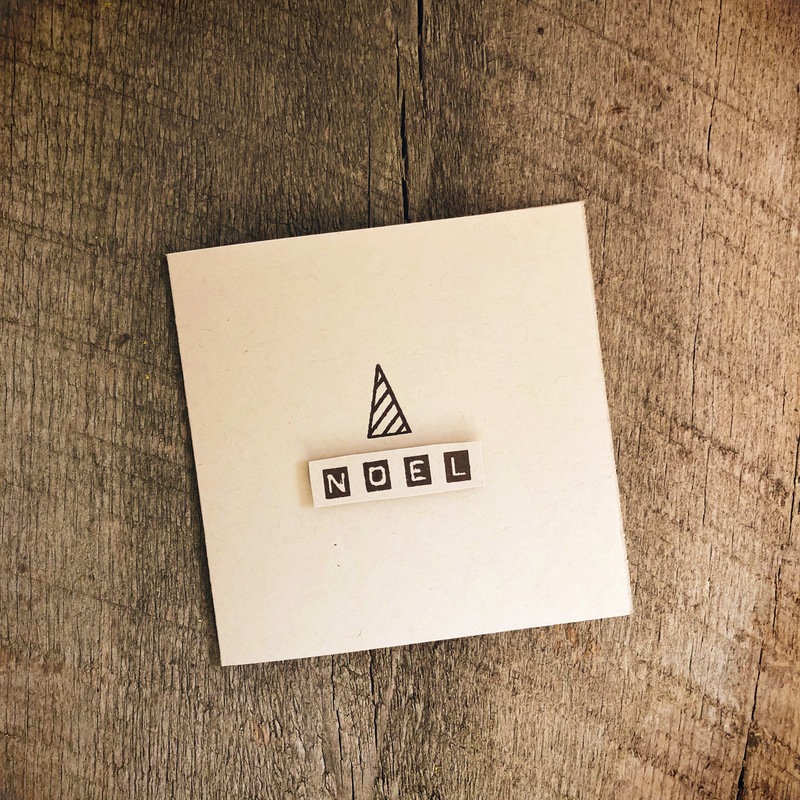 I used Crumb Cake cardstock, the Labeler Alphabet set again and the “tree” is actually an upside down ice cream cone from the Broadway Birthday stamp set! 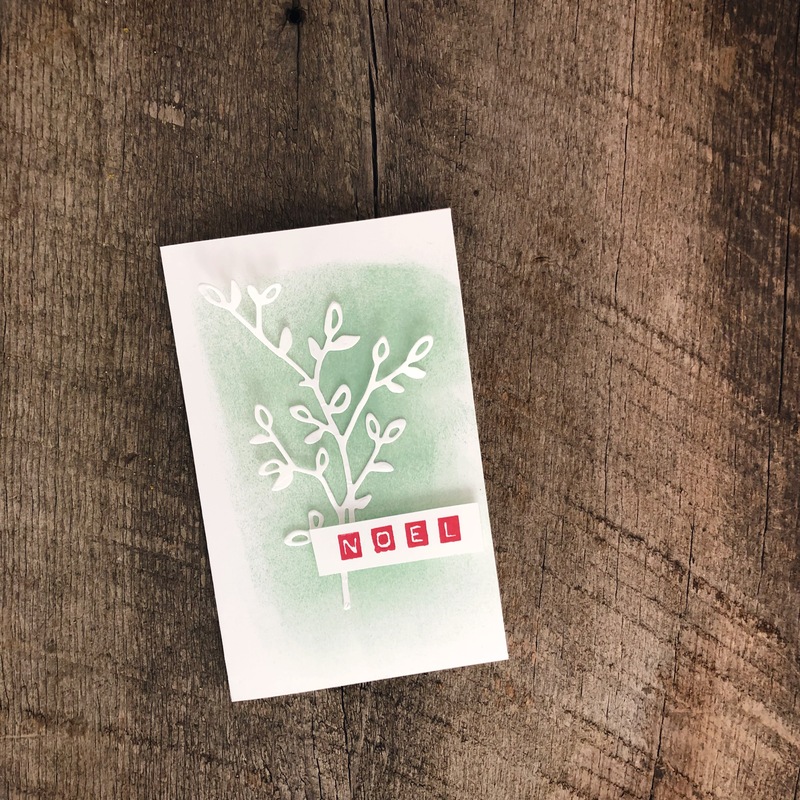 Then the same card in Garden Green and Real Red on Whisper White cardstock. I also grabbed some retired items from the last few years. The “happy” embossing folder was perfect to combine with the letter stamps. 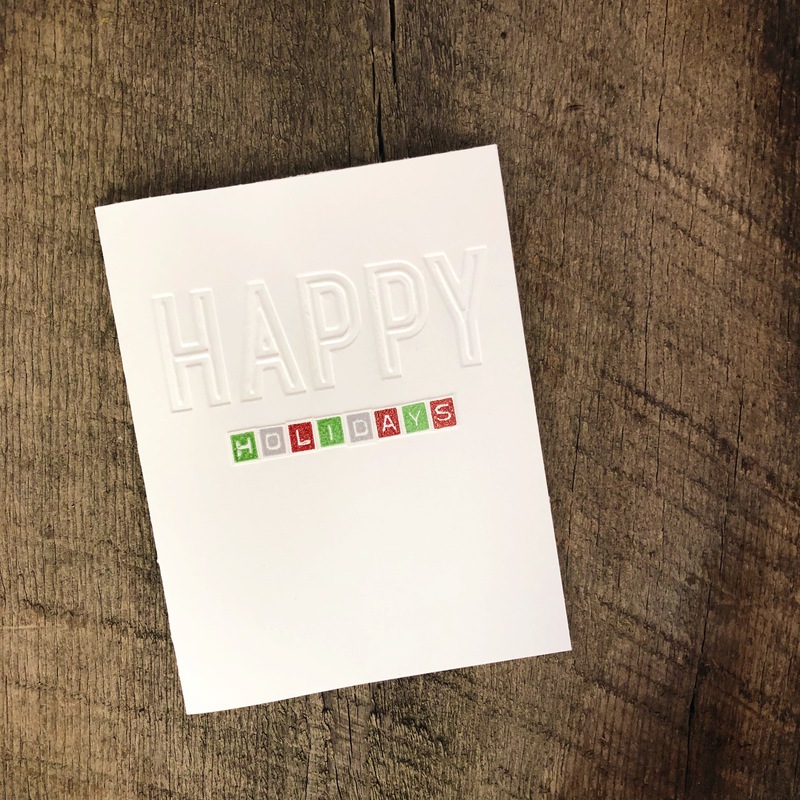 I found the quickest way to get the different colored letter stamps was to stamp the word “holidays” three times- once in each color – then I cut out each letter separately and combined them on the card. 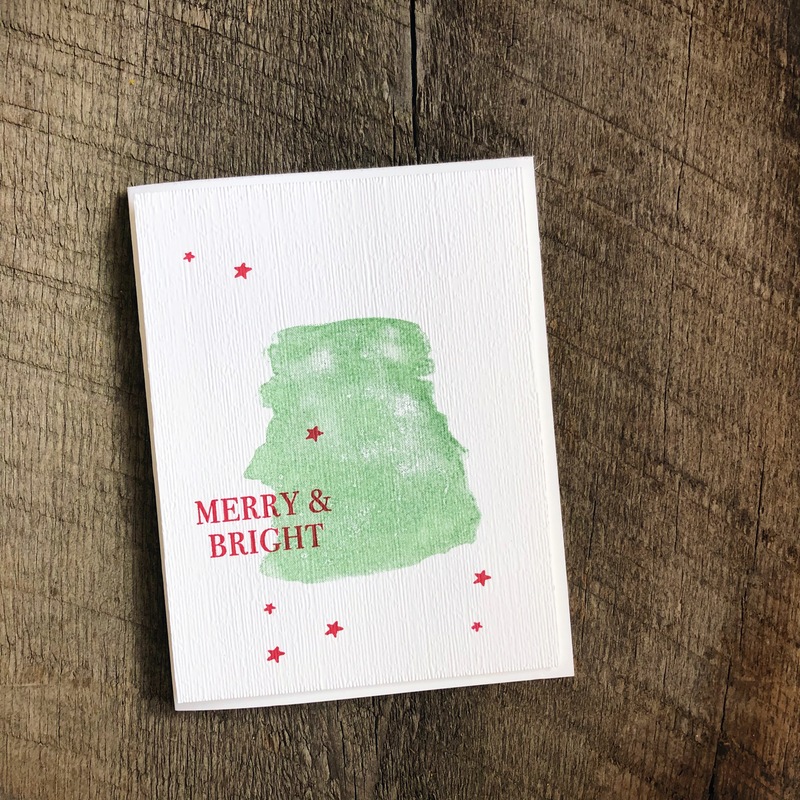 This wreath stamp was not a holiday stamp, but I drew on some “berries” with a marker and added a retired holiday stamp. This card was my inspiration. 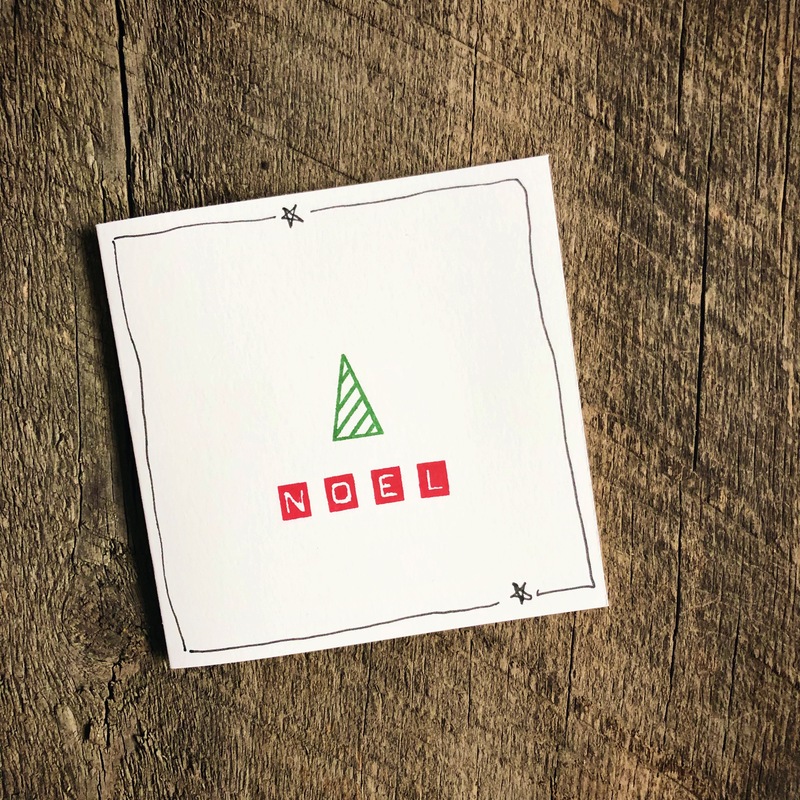 Thanks for looking at all my Christmas cards and make sure to check out the rest of the posts in this month’s hop! Next up is Kelly. 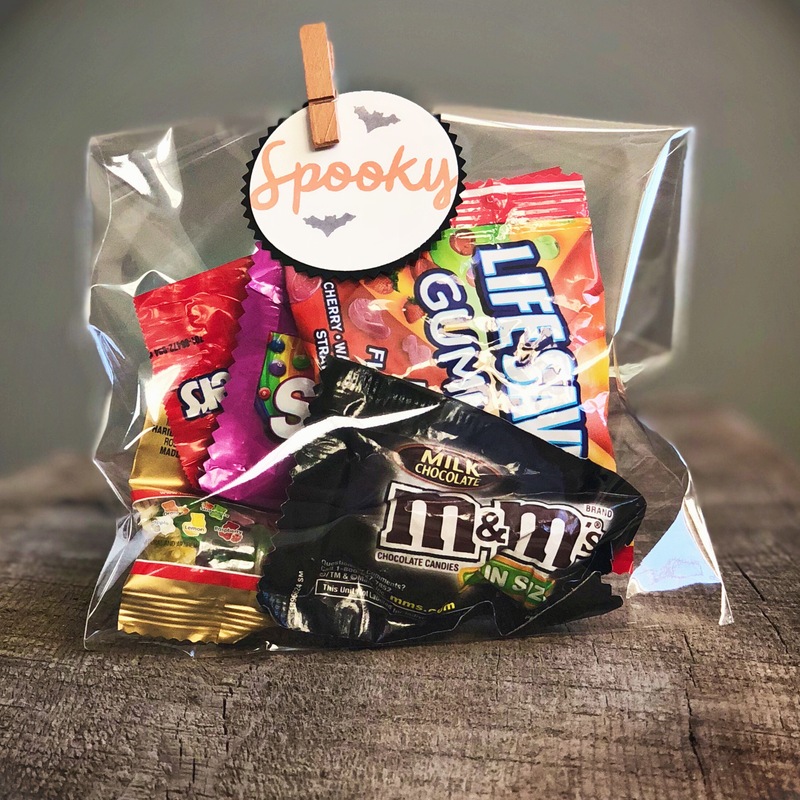 Welcome to our Halloween themed blog hop! 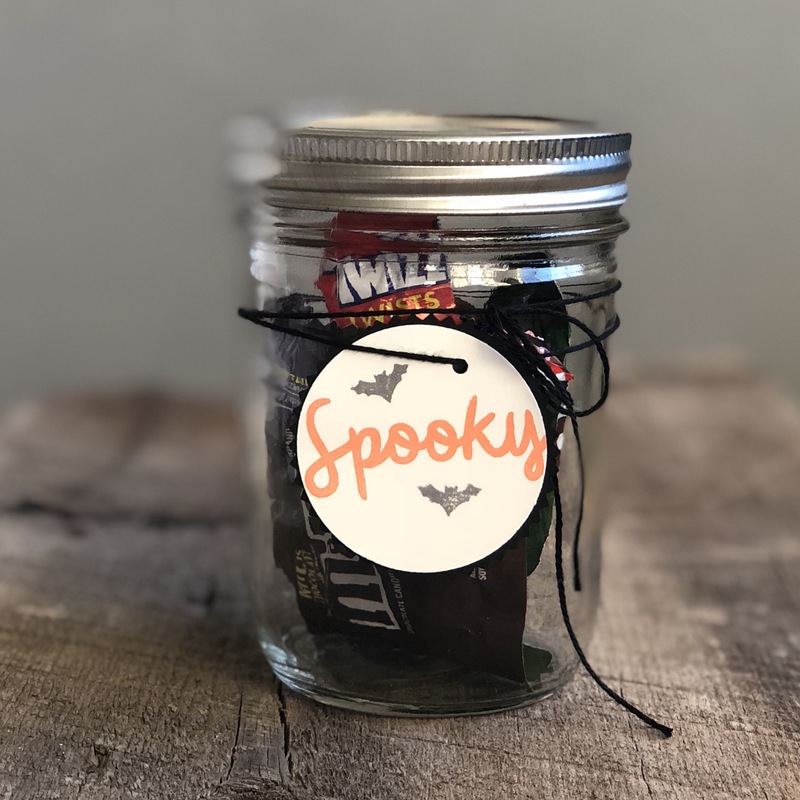 I took my Paper Pumpkin kit from last month and used the stamps to make some more treat bags and jars. The stamp sets from the Paper Pumpkin kits are always my favorite part of the kit because you can use them for so many different things. This was the kit before I unwrapped it all. 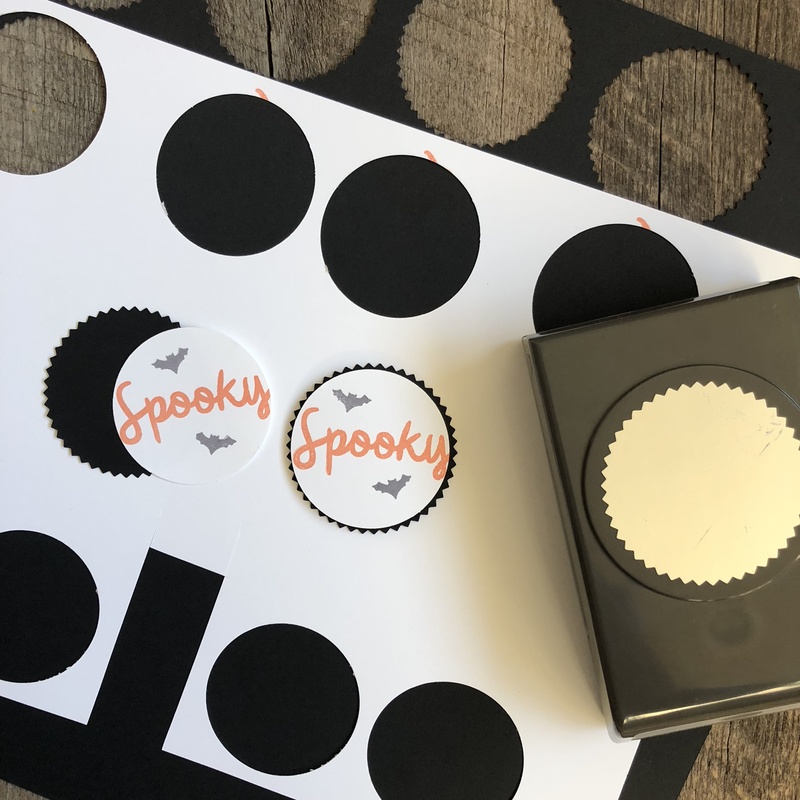 I used the “Spooky” stamp and the bat stamp to stamp on these punched out circles. I used the 2 inch circle punch and the starburst punch to create a layered look. And here are a few of the final products. 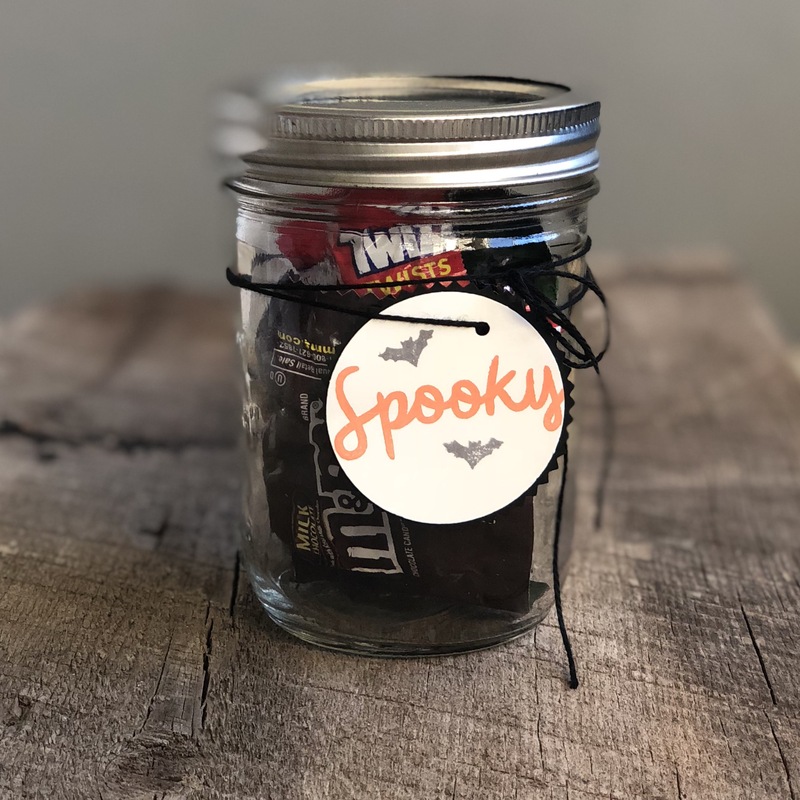 I love using mason jars to use for treat gifts. I just punched a tiny hole in the sentiment circle and tied it around the mason jar with some black string. 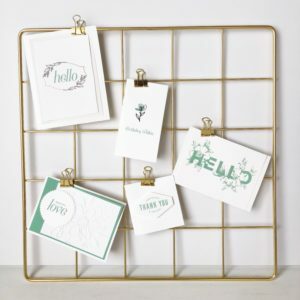 Hope you enjoyed seeing how you can use just a few items to create a simple gift. Make sure to check out the other creations in this Halloween Blog Hop. And here is the list of everyone in this month’s hop! Yesterday was the first day of Autumn here in the US, and the change in seasons is in full swing. The Oregon rain has begun to reappear, leaves are turning yellow and red, and the cooler weather is telling us that Fall is here. I’m excited to be part of our Autumn themed blog hop – grab yourself a Pumpkin Spiced Latte and be inspired by our Autumn creations! When I think of Autumn, the first things to come to mind are the gorgeous colors that we all think of in this time of year. I’m obsessed with color. 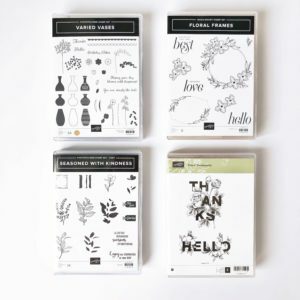 The ability to play around with different colors in the form of stamp ink, watercolor pencils, and markers is one of my favorite things about Stampin’ Up! I often look at crafting the same way that I look at the wardrobe in my closet. 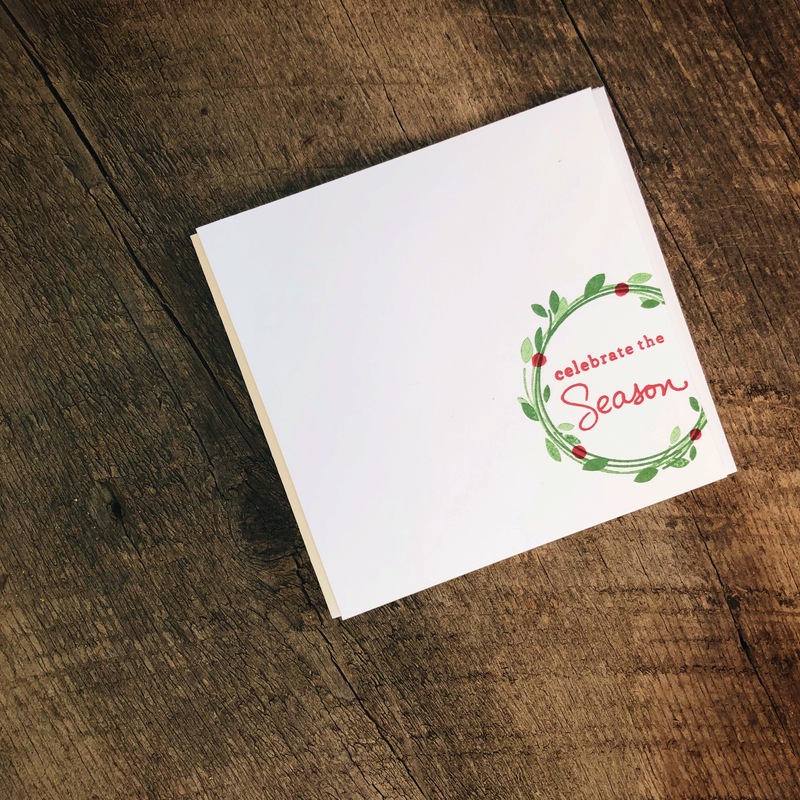 I focus on the basics, and then change things up throughout the year with different items depending on the season. 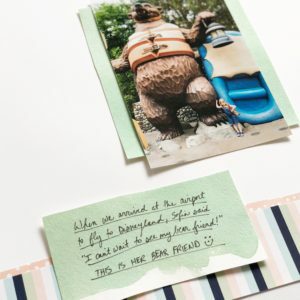 In the same way, I have some go-to stamp sets that I use all the time, but change up with different color inks and pens. For the items I created this month, I used an older set of Designer Series Papers (DSP) as my color inspiration. “Color Me Autumn” was a set of papers in 2014 and included some colors that were eventually retired (Blackberry Bliss and Mossy Meadow) but they just returned, so I couldn’t wait to play around with these inks for the cards I made! These are the papers just so you have an idea of my inspiration. I have a few birthday cards to send off in October, so I thought it would be lovely to use Fall colors on a few birthday cards. On this one, I used Blackberry Bliss, Old Olive, and Cajun Craze for the candle stamps, Crushed Curry for the flame, and Soft Suede for the sentiment. I have a subtle layer of Blackberry Bliss cardstock layered underneath the top white layer of paper for a tiny bit of color contrast. 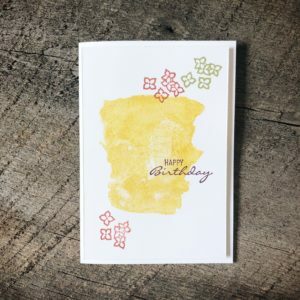 For this card with the yellow “watercolor” background stamp, the Crushed Curry yellow was a bit too bold so I “stamped off” the yellow on a piece of scrap paper (I just grab what is around me, in this case it was a half finished coloring page that my kids had discarded) and then stamped on the card. 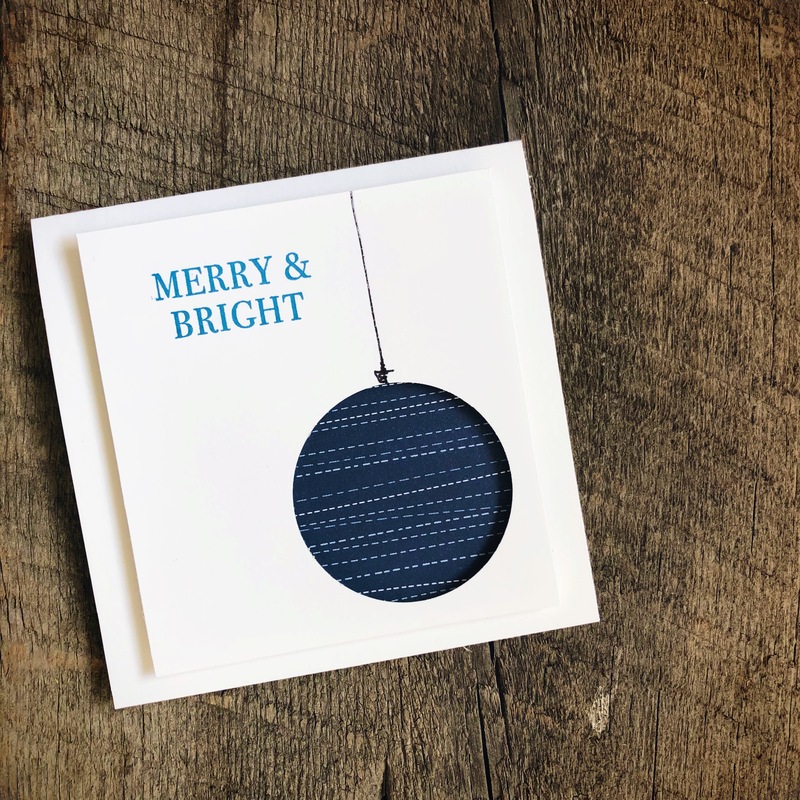 Thanks to Caro’s Kaartjes for the inspiration for this card. 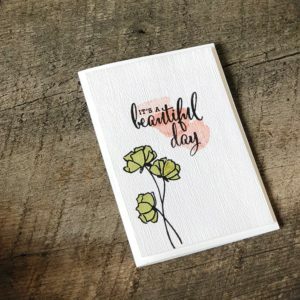 I absolutely adore the Stampin’ Blends markers, and used an Old Olive marker to color in the flower in the card below. Then I used Cajun Craze ink (again, stamping off on that scrap paper first) for the “watercolor background behind the words “It’s a beautiful day.” After I did all the stamping, I ran the top layer of paper through my Big Shot diecutter with the Subtle Dynamic Textured Impressions Embossing Folder. 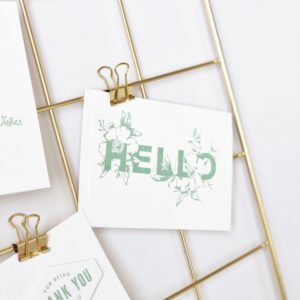 I love this embossing folder and how it adds just a bit of subtle texture to the paper – it is quite aptly named. 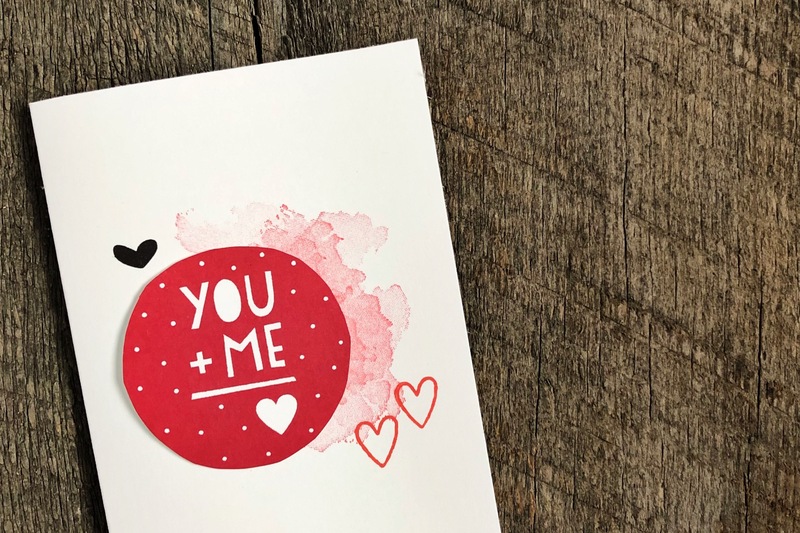 I hope you enjoyed these creations and can see how easy it is to use color along with simple go-to stamps to evoke the feeling of whatever season you are in! 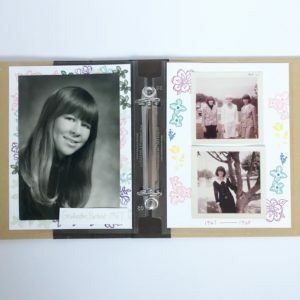 Our team’s theme for this month’s blog hop is FLOWER POWER! 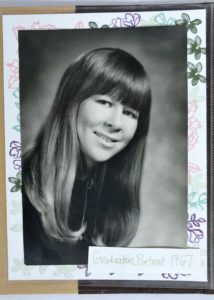 When I think of “Flower Power” I think of the 1960’s of course. 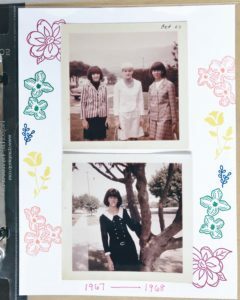 So what better way to use this idea than to pull some old photos of my mom’s from the 1960’s and add them to my daughters’ family scrapbook? 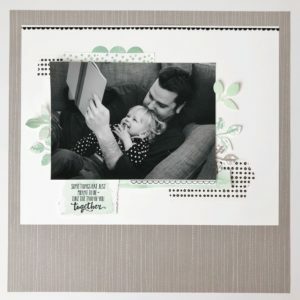 I used several different stamp sets from the new catalog for some super quick and easy scrapbook pages. Make sure to hop around for more Flower Power inspiration! Hi everyone! I’m so excited to be part of a blog hop with several amazing ladies around the world. 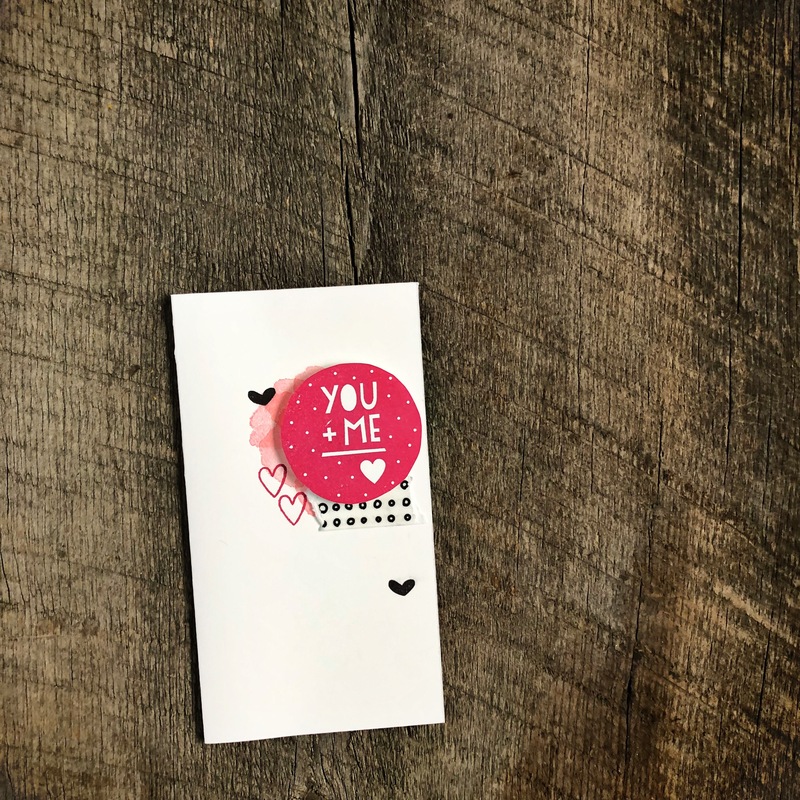 We are celebrating the return of my favorite Stampin’ Up! color – Mint Macaron! 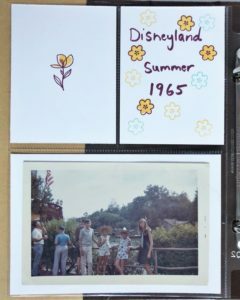 I made several cards using this color, and a few scrapbook page layouts as well. Make sure to hop around the other blogs to see what else you can do with this amazing color! I love how quick and easy this card was! 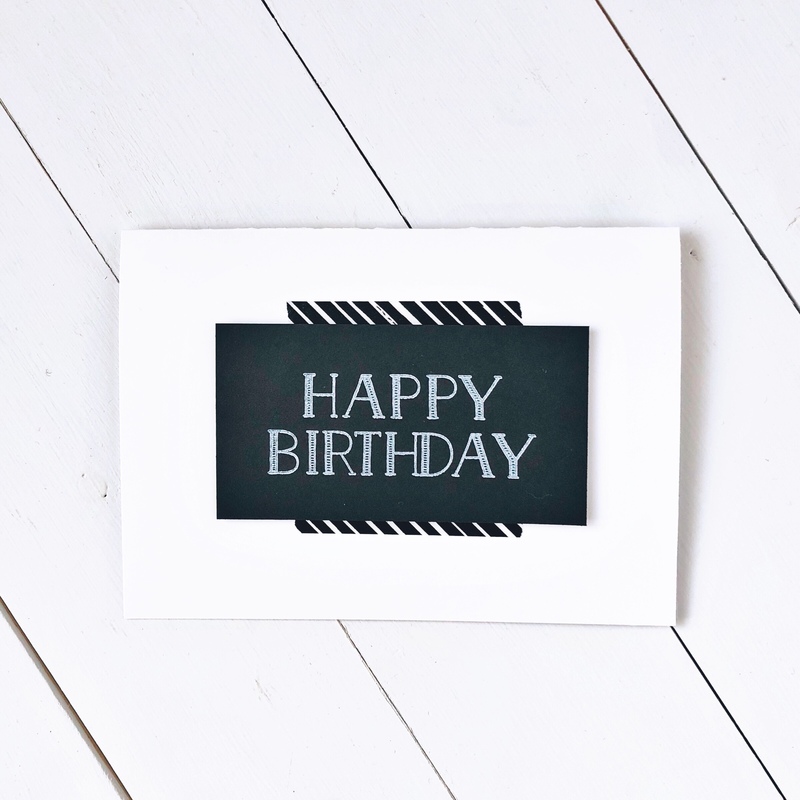 Just a bit of washi tape and a stamp from the Big on Birthdays stamp set.